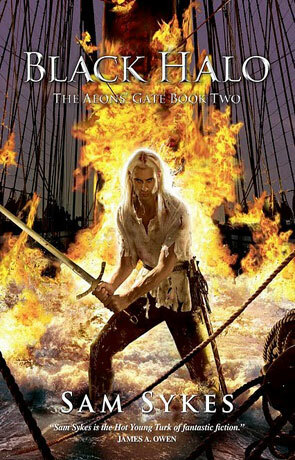 Tome of the Undergates was a fun, bloodthirsty and action packed novel with a young and yet confident voice and Black Halo promises more of the same, picking up where the first book ended. These mismatched and grumpy souls that make up Lenk's rag-tag band manage to get themselves shipwrecked on an island. This island also just happens to be a graveyard for demons and dragonmen alike. Inhabited by lizard men, it's also full of secrets and very soon is likely to be a battleground. Meanwhile back in civilisation the Librarian Bralston is being sent on a mission to find out just what has happened to the Tome of the Undergates and to punish any who have misused magic. There is much to like in Black Halo, the author's confident, sassy, vibrant prose and youth-full exuberance is little short of brilliant while the descriptive action, fighting, magic and sneaking are superb. I loved the way that these unruly anti-hero's are portrayed, each a strong character in its own right and every one brought to life on the pages with style. The book does seem to get off to a bit of a slow start though but the more you read the more you realise that this is not only purposeful but very clever. The focus placed not on the possible cataclysmic events but the very personal ones of each character. The way that the various hallucinations are acted out are a stroke of genius which manages to really mess with your head - the talking monkey being one of the highlights. The decision to split the party up is also a clever one and allows the reader to really get to know each character and makes for a much better story than it would otherwise. The sheer imagination of the author is also pretty astounding and he has to be one of the most off-the-wall authors writing fiction right now, from purple women to giant sea-serpents there isn't really a dull moment throughout the book. I loved the way that the author doesn't coddle the reader, avoiding the trap of big info dumps and only providing world-building when it's actually needed for the plot or larger story. The real focus of the story is on the characters and this is where Black Halo really shines, it's almost an Antithesis of the high fantasy and heroic fantasy genres, deliberately making sure that the large world and indeed the larger story are kept vague and just out of reach which firmly places the focus on what really makes a good story tick - the people. These characters are superb in their anarchistic and self-centered attitude - a moral ambiguity that has a much closer reflection to reality than many novels ever attain. Sykes manages to accomplish this feat without the story coming across as too "gritty" or "low fantasy", instead layering these almost real people within a big budget fantasy that retains its roots. The essence of what Sykes has captured here is like the literary equivalent of the "Lost" TV series at it's height, character focused with superb action and a teasing reveal just out of reach but ultimately dealing with each characters personal plight. It's a "de-construction" of High fantasy, a fresh perspective on a tried and tested genre that re-interprets many of the tenants that the genre is founded upon. Unpredictable, highly amusing and very, very clever Black Halo can be enjoyed on many levels. On the surface it's a high fantasy novel with superb characterisation and a great band of anti-hero's told with charm and intelligence however dig a little deeper and it becomes a challenge to the genre itself, an invitation to question and re-examine the very nature of the "fantasy" novel. Written on 2nd March 2012 by Ant.